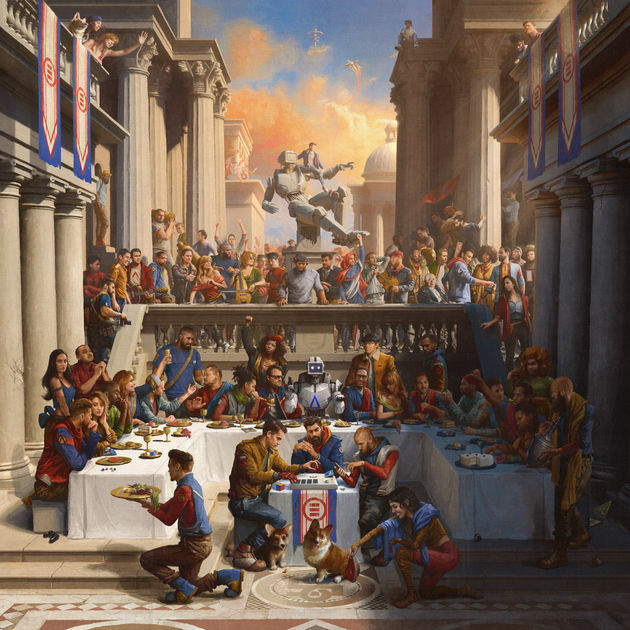 Everybody is the the 3rd studio album from Maryland rapper Logic. For those of who who aren't familiar with Logic, he's been blowing up in the past 5-6 years or so and I know a lot of fans, especially myself, have been anticipating this album for a while, and I can tell you that this album is the most ambitious and focused record he's put out so far. Logic talks a lot about race, and how it affects the lives of those who are subjected to the labels brought upon by their race, as well as his experiences as a biracial person and how we experiences racism from both sides, both black and white. But the most universal concept explored here is the idea of accepting everybody, regardless of race, color and creed (hence the name of the album). The album's opener, Hallelujah, is a 7 minute track with Logic's uncalled intention of opening with a triumphant and over-the-top song. Not saying it's a bad thing though, I actually really like this track and I believe it fits Logic's approach to introducing us on a record. The latter half of this track introduces to this album's story. To give a basic rundown, Atom is run over by a car on his way home and meets God, who says that Atom must be reincarnated into every human being that has ever lived in order to experience the broad spectrum of diversity (I know this sounds ridiculous, but trust me, once you listen to the album it'll make sense). The album hits with a lot of songs, some melodic, some hard-hitting, some straightforward, and all revolve around the topics which I previously mentioned, as well as some personal remarks which Logic expresses, like rappers refusing to talk about their mental state in their music or our lives centering around our phones. This another strong effort from the man, and shows that he has matured from his last two albums, coming through with serious topics and a sound he has honed. However, I can't say that it's nearly as good as the last two, since it lacks banger appeal or even lasting appeal, and it gets a little monotonous when he beats you over the head with the same idea for like 13 songs. Everybody gets a 3.5 out of 5. I suggest you listen to his first two albums, Under Pressure and The Incredible True Story, so that you may have a better understanding of what goes on in this album.